We were honoured to be invited to the VIP opening of Seaton’s new LED gym facility. The gym spacious with plenty of room for both machine based and free weighted exercise. 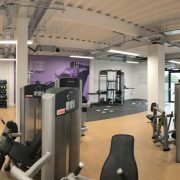 There is also a variety of CV workout equipment and a studio for classes such as circuits, yoga, spinning and body pump. It will be a great asset to the town, we just recommend that you warm up, cool down and stretch well to minimise injuries!